Can you imagine building your home out of spite? 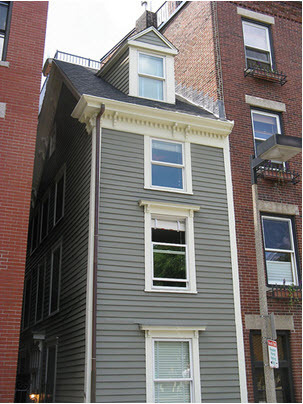 If either of the legends behind it is to be believed, Skinny House in Boston must be the narrowest, most spiteful home building project ever realized. The house, more than 100 years old, is directly across from the front gate of historic Copp's Hill Burying Ground along Freedom Trail in the city's North End. The residence is so narrow - just over 10 feet at the widest - that the main entrance is located in the alley between the house and its neighbor to the left. Local legends agree that the house was deliberately erected to block the view from the house to its right. But the players change depending on the legend. One story has it that the builder erected it in the late 19th century to shut off air and light from the home of a hostile neighbor over a dispute. Considering that Boston's North End has long been a densely populated working class neighborhood, it's not hard to imagine unrest between crowded neighbors spilling over. Yet another story pits brother against brother, contending that a Civil War soldier had returned home to discover his sibling had built a large house on his deceased father's lot, leaving the veteran with only a tiny parcel of land, presumably too small to build on. Bitter at his brother's actions, the soldier then constructed on the remaining sliver of land a house just large enough to block the view and the sunlight from his brother's abode. While the debate continues as to the correct theory, there's no doubting the dwelling's odd proportions. The house tapers to 9.25 ft at the back, and the interior walls are as close as 8.4 feet apart. The home's most narrow interior point is 6.2 feet across, (close enough for an adult to touch opposite walls at the same time).There are only five doors throughout this four story domicile, with the living room and bathroom - on the second floor - one of the few areas separated by a door. It is somewhat ironic that a house originally built because of friction has ultimately fostered a sense of cooperation. According to modern-day owners, if they have a party with at least 10 guests and one person has to go to the bathroom, everyone has to shift.